Working on an important file and it gets deleted permanently. Or all your photos get deleted permanently by mistake. Just imagine a situation and you will be shocked. What if it happens in your reality? It may happen sometimes that you clicked shift+ delete by mistake. Just a single click and everything will vanish. With those who ignorantly work on computer experience accidental deletion many times. It may happen that you deleted the wrong version of a document. You were about to save but you accidentally hit the delete button. Generally, the problem comes when there is a mass deletion. What can be done after accidentally deleting the photos? To check what has actually happened? Is there any way to recover those photos? Will you be able to recover permanently deleted files? The answer would be yes. It is feasible to recover the files. This process is known as Photo recovery. It can be said to be the process to rescue all the photographs. It can be derived from failed, corrupted, damaged or inaccessible secondary storage media. Actually, the problem arises because it cannot be accessed normally. One of the major reason for Photo loss is both hardware and software failures. It is of great help to know the data recovery. In general, a person needs to get a Recovery because of the physical damage made. The deleted data from storage devices or logical damage to file system needs to be got back. It is the very first thing you should do. Accidentally missing a file and deleting file mistakenly are two different things. You have to ensure that your respective file was not accidentally moved to some folder. There are chances that you move the photos to some folder. For those who don’t know it happens when you drag a file and drop it over a folder. It is not at all the big issue. Still, it creates a problem for many inexperienced computer users. It is because they think that they have permanently lost documents. That’s why it is very important to see that the respective file has been deleted permanently or has been shifted. If you are damn sure that the file has been deleted then you may proceed to file recovery. You are required to preserve disk space. It is the place where the file is actually stored. Even if the file is deleted from the system, it stays somewhere. It is only marked as deleted. And in lieu of this the space used by the file is marked as available. Therefore, this disk space may be used for new files that are created by you or operating system. What has to be done now? Are you confused? There is no big issue related to recovery. You have to simply isolate the file system. What a general user will do is to install any software to recover the file. Please do avoid any software installation. Don’t agitate the disk volume where the missing file was saved. Don’t install any simple data software. When you are worried to recover the deleted files, you need to have a better option. You have to simply install data recovery software. We personally recommend you EaseUS Data Recovery Software. Among many free solutions available around, it is known to be the best of all. You have to find data recovery software for your system. Precaution is better than cure. So make sure that you install this software on the proper drive. Be aware that if it is saved in the wrong place, it might lead to many problems. You know what the best thing is? It is available for free of cost. As far as the working is concerned, it will overwrite data. It is very likely that this installation will successfully recover the deleted data. The overwriting will be done at the place which was used by your files. If possible try to use another PC for file recovery. It will be a better option. Start using data recovery software firstly. You have to analyze the partition. The partition will be the place where the deleted files were saved. The software which you have installed will list all files. It installs all the files that are found to be deleted. There is also a provision to have knowledge of the percentage of the file that could be restored. But it may not work sometimes. It generally happens when the original file data was overwritten. The overwritten will take place in other files. Its result will be the failure of restoration. The recovery process will not be able to restore the whole file. If the deleted file was the text file you will still be able to use the recovered text. The next step is the simply restore the file. Till now you will get all the information about your hard drive. You will be able to identify the working of your file system and deleted files. Now it’s time to proceed with file recovery. Now you are done with the installation of software. It will create a new file from the data. This restored data will belong to the original file. What you have to do is to simply open the file. You are required to check what was restored. Now it becomes a matter of luck. If you are lucky you will definitely get your data back. For those who want to recover files or photos can do the same to restore the files. This procedure can also be used to recover deleted photos. This process can be followed if they are deleted from the digital camera. As far as the technique is concerned digital cameras use memory cards. And these memory cards use computer file systems. So in this way, your data will get restored. In short, there are few important steps to be taken to restore all deleted files. Firstly ensure to double-check your computer’s recycling bin. You have to see if your file is still waiting there. For those, you have to right-click the file and choose the “restore” option. If it works then it’s alright. If that doesn’t work, you have to navigate back to the folder. This folder is the place where the file originally was placed. Whenever a file gets “deleted” from your computer, space becomes available for use. The respective file is marked as free. The computer overwrites the space. You can take a breath as the computer won’t overwrite that space unless it has no other option. Ensure not to save or download anything else. It is the biggest mistake every user commits. Remember it’s not a simple thing to go back. Whenever you save anything or download anything you are ordering the computer that you don’t need the file anymore. It is not easy to restore deleted data and it is not that difficult to restore as well. It is because you have got much software for the same. But be careful next before deleting everything. You will be astonished to note that various soft wares are there to recover the data. But many of them are available for free. This software successfully scans the dark hard drive. You can definitely get back all your deleted pictures, videos, and documents. The software is really a great, user-friendly option. You know when the problem comes when it is the case of mobile. The issue depends upon the kind of file engaged. It is also a matter of concern that it is an actual device or hard drive. It is not easy to get the deleted photos again. Try not to get stuck in such chaos. You need to safeguard yourself from this unfortunate situation. There is an app you can use. It is called Dumpsters. You can use it as a “Recycle Bin” for your device. As far as its working is concerned, it is normal as usual. Once you delete any file, it is sent to the Dumpster app. The deleted data will remain there for some time. You have to open the app to confirm that the file has been permanently deleted or not. 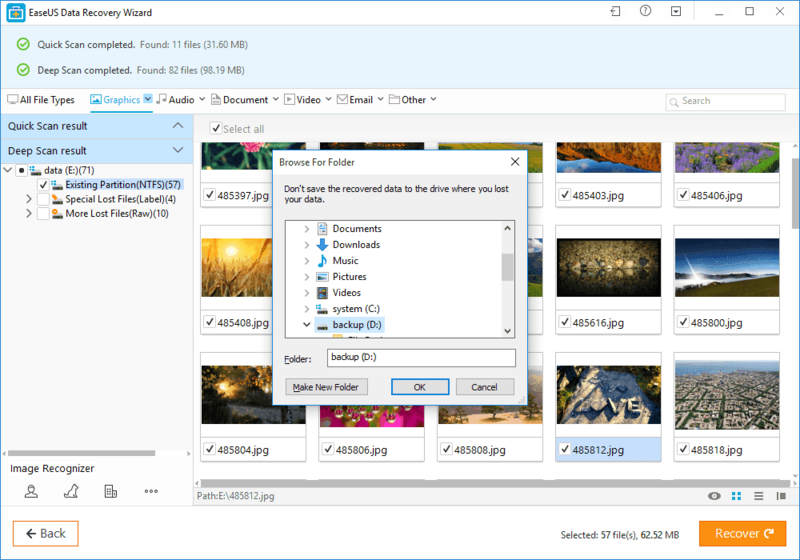 Thanks for sharing this post with us to learn some unique way to get Recover Deleted Photos from Computer. I just want to know can we get deleted Photos after deleting recycle bin ? Read the full article because that is what we have covered here.